In and around the Detroit area, it’s not uncommon to spot a random late-model Chevrolet Caprice, Ford Crown Victoria, or any other body-on-frame car sitting on comically large wheels. To bring you up to speed if you’re unaware, these vehicles have been categorized as “donks”. There’s no need to know why. But to see a Chevy Camaro rolling around all donkned-out — with 32-inch rims, no less — is a rare sight. Let alone two of them at once. Just look at that turning radius! Classy? Tasteful? Sacrilegious? We’ll leave it to you. OK, more than incredibly stupid. OK, incredulously inanely, insanely stupid. I like the snippet on Autoweek’s Vinsetta Garage TV show during an interview with the owner of The Hot Wheels shop: He said everybody knows huge wheels and skimpy low profiles reduce a vehicle’s performance – but nobody cares, “it’s the look”. I think they look pretty foolish and reflect that of the owner. Well it does go about in circles rather nicely. To be fair, not many cars can drive around in a circle and look stupid doing so. I’ve tried in my car, but it just brings me back to where I started; I couldn’t make it look stupid and I tried for about five minutes. To correct the author of this story, a donk is a 1971-1976 Caprice or Impala only. It is called a donk because the animals on the emblems on those cars are said to look like donkeys. 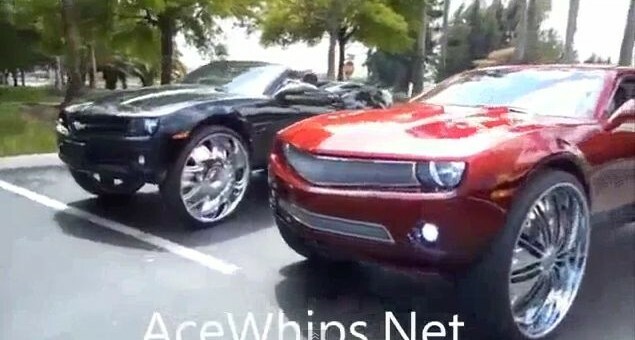 Therefore, a Camaro with big rims is just a Camaro with big rims. Not a donk. Thank you. I stand humbled and corrected. I now know the correct way to use donk. Lord knows that comes in handy. purist donk enthusiasts only recognize Impalas. This was posted on Autoblog as well, and everyone seems to think this is “incredibly stupid” and that the owners are “foolish” . Well, I would never do that to my car, but I respect a persons ability to do with their car whatever they want. And can anyone think of a car that will get more attention on the road than this? I think not. This will turn more heads than the Aventador. I dont think anyone is “foolish” for making a car look like whatever makes them happy. I haven’t had such a good laugh since married with children was on the tube. i bet this has to use one of the truck chasis. Not a good look for sure. Totally out of balance look with over size wheels. Not my thing. The red one kinda freaks me out with the rims not rolling. Nope. Not for me. In my old neighborhood, the bigger the wheels the bigger dealer you were. Wow! that is just about the ugliest thing I have ever seen done to a Camaro. Yikes! Think of how the money spent for the tires and wheels could have been used for adding engine performance enhancements, or to buy custom body parts like wide body rear quarter body parts. Am I wrong or wouldn’t a lowered Camaro with custom wheels, performance headers and exhaust and custom paint or graphics create more positive “look-at-me” impressions than 32″ wheels and tires? I am with you, John. I would way rather put the money into performance parts and boost that horse power. I want to see them take a turn at some rate of speed. Do they fall over as readily as it appears they would? Amen brother! You’re preachin’ to the choir. God bless America! I mean if a guy wants to look like a fool – he should have the full and free right to do so! And if a guy wishes to burn fossil fuel like there’s no tomorrow – and make it more expensive for you and me because he’s a selfish a**wipe, well, darnit – he should have the right to do so! Yes I do believe that “if a guy wants to look like a fool – he should have the full and free right to do so!” , because while that guy may look like a fool to you, he may look great to himself and the people he cares about. By that logic you would condemn anyone you doesnt look like the way you want them to look like. Why? So you would insult someone because there car is a color you dont like, so suddenly their “foolish” for picking green, because the almighty all knowing dictator James decreed that the color green is “foolish” so therefore that person does not have the right to pick the color green. Really? I would argue with you about this further, but if you seriously believe that someone does not have the right to look “foolish” without getting insulted by certain people just because those people dont conform to those certains people expectations of society then my arguments will make no difference to you, as your so blinded by whatever causes you to believe that people and their property should look like the way they you want them to. I dont know where this came from as fuel consumption was not mentioned in either my comment or the article, but ill respond to it anyway. Yes he has every right to burn that fossil fuel and do whatever he wants with it, why? , because he payed for that fossil fuel for his own money- King James didnt buy it for him. By that logic, no one has the right to buy more food than neccessary to stay alive, because if they do, like over 2/3rds of American do, theyll be raising the price of food for the rest of us by their own selfish desires of wanting eating more than is neccessary to stay alive. And those 2/3rd people who eat more than they need probably include you! So you think we should all be driving priuses because driving a corvette for your own selfish desires of wanting to drive a car a car thats fun to drive and has power is heresy because King James doesnt approve, and of course King James payed for your car so he has every right to tell you what kind of car you can drive. @ Babersher: Dude – take a Prozac, willya? I’m partaking in the good ole American pastime of poking fun… Your post sounds a bit more serious… A small vacation could do you a world of good! Look – if you want to debate this thing — I’ll roll up my sleeves. I take the stance of using the word “foolish” – or technically: ” LIKE a fool”. The reason is because the Bible says: “He who calls another a fool is a fool to God”. And think about it – we’re all fools and nobody is “holy” so it is hypocritical to call someone an idiot, numbskull, dolt or fool, right? I do foolish things ( like you say: eating too much is foolish ) and so do you. So when we hear others call someone an idiot, they really are only pointing back at themselves. “Foolish” is another thing. Can’t say or see anything wrong with someone pointing out when another is foolish. And it goes w/o saying we are expressing our individual opinions, which we all have a right to. Putting others in danger is foolish, wouldn’t you say? Remember when Consumer Reports rolled Ford Explorers and made a federal case about it? I agree with them. I would say a vehicle that puts others’ lives at peril is a concern and should be pointed out. Care to road test one of these modded cars with 32″ wheels and pencil thin sidewalls? In fact, since you’re so passionate about criticizing my critique – I’ll challenge you, Babersher, right here and now to go find one of these cars and road test it. First do the slalom, then an emergency avoidance test like auto manufacturers do. What you do is – go 50 mph and have a truck pull out to your side , then do it in the wet. Do some wet road cornering, then try a quick freeway-speed lane change emergency manuever. I’d say by then you’d be shaking with white knuckles, if you hadn’t put the car on it’s roof, and/or in the ditch. These cars are unsafe. People on this commentary thread have stated their opinions that this ADULT BIG WHEEL nonsense is just that – because of the obvious high-dollar bodywork, undercarraige modification and sheer expense of one tire/wheel combo that costs as much as a new Spark and takes these vehicles down to the safety and handling dynamics of a RED RYDER wagon, a plastic BIG WHEEL or stilts! Other ilks of folks who get their kicks making lowriders that bounce or tossing small mortgages worth of money into a subcompact ricegrinder may not posess the taste of this or the other posters, but we heartily accept and agree with their right to express their individualism and spend their money on their vehicle as they so wish. The difference is that A) we have a right to express our own opinion, and B) These mods have literally resulted in a vehicle that puts you, me, and our families in danger on the road. IMO, I think these cars should be subject to Highway Patrol tests to insure they meet certain public safety standards. Uber-liberals point fingers and scream foul when others express opinions that they themselves do not deem “politically correct”. What’s funny is when they do so, they are pointing fingers and making subjective judgements of their own. Everyone’s opinion matters as long as it’s in line with their own. Ok fine, maybe I did overreact a bit. That car is unsafe but thats not something you or anyone else mentioned in previous posts and was just brought up now. Thats a good point but the same could be said of many cars on the road today. And no I dont think eating to much or using too much gas is foolish, your words nor mine. Where did this come from? How is this conversation political? I dont recall saying anything political at all, the problem is that people like you turn everything political to make it easier to justify your position. I dont think that term has a place here, unless you dont know what it means, this is a forum for God’s sake, not a Presidential Debate. You and I have nothing to gain or lose from this conversation. The only uber liberal position or statement by either of us was King James decree that you cant use as much gas as you want because it makes it more expensive than the rest of us. I agree with this statement wholeheartedly , but your comments suggest that you dont. Charlton Heston said politically correct is tyranny with manners.